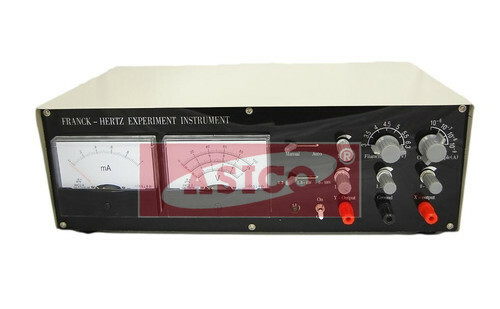 This Franck-Hertz Apparatus is designed for college students to demonstrate the existence of quantized states. The experiment can be performed in less time because the use of Argon tube eliminates the need for tube heating (as in the case of a Mercury filled tube). The data can be recorded manually, or directed to an oscilloscope or computer for display. 1. Voltage supplied to Franck- Hertz tube. UH (filament voltage): AC: 3V,3.5V, 4V, 4.5V, 5V, 5.5V, 6.3V. Annual Turnover2011-12 Rs. 1-2 Crore Approx. We are one of the foremost Manufacturers, Exporters and Suppliers of Amplifiers, Analog Lab Training Modules, Communication Lab Training Modules, Digital Lab Training Modules, E/M Experiments & Oscillators, Electrical Bridges and Power Supplies. In our product range, we provideEngineering college apparatus,Engineering lab apparatus,I.T.I lab apparatus,I.T.I college apparatus, ploytechnic lab apparatus,ploytechnic college apparatus,scientific instruments,electronics apparatus,physics Instruments,control system lab,PCB Lab,Instrumentation Lab,Network Theorems,Microwave Lab,Electrical Bridges,Portable Meters,Function Generators, Communication Lab,Filter circuits,digital electronics, multivibrators,oscillators, E/M Experiments, Operational amplifier kits,amplifiers,power supply,Dynamic Demonstrator. With the support of our team of professionals and our well established manufacturing unit, we are capable to manufacture and supply a high quality product range to our valuable clients. These products are manufactured from high grade raw material in our well developed manufacturing division as per the international quality standards. Our product range is valued for its Quality standards, high Efficiency, Corrosion resistance and Tensile strength that enable us to create a huge client base across the Indian subcontinent. ?